Folks, it’s up to you what to believe. Only YOU can make that decision. There has been speculation even since the “Private Transaction” that Mr. Steven Samblis is still in charge of IMTV. Many believe that Mr. Joseph Sirianni is simply a figurehead that has been installed to remove the negative connotations of the past actions of Mr. Steven Samblis and his running the company. Some say running the company into the ground. IMTV has had a history of what many call “pumping and dumping”. It’s a very common practice in what’s called the “stinky pinky” public company world. Some think the “Private Transaction” was just that, a pump and dump scheme to sell stock. The concept is… put out grandiose press releases (written by the company but made to look like news), then the stock sales will significantly increase based on irrational exuberance by naive investors. Nowadays most have come to know this practice as “fake news”. It’s also well documented that IMTV is significantly oversubscribed with regard to shares pledged as collateral for previous cash advances by equity financiers, like Asher Enterprises. Oversubscribed to the tune of 61-BILLION shares (yes, not a misprint – BILLION). (see below – click to enlarge) and HERE. Now, with this level of debt load it would be reasonable to assume that drastic measures would be needed to manage this debt. 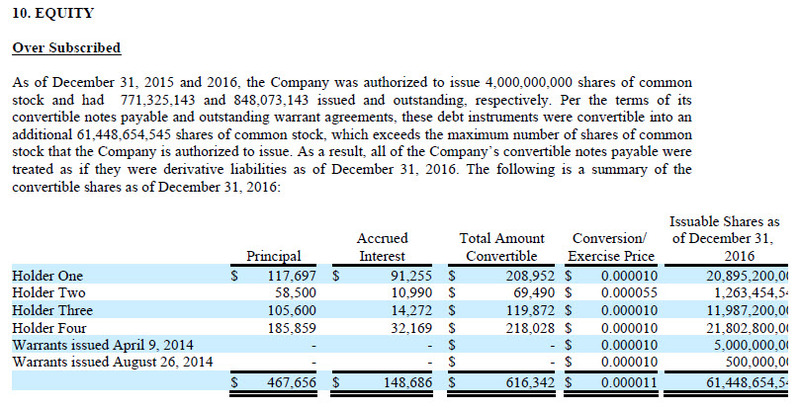 That’s a whole lot of shares that need to be sold to the public to satisfy the equity financiers. Do you really think those equity financiers would be forgiving any of this debt??? VERY doubtful. They have already paid out the cash to IMTV, and they want to be paid back… wouldn’t you? So, is it unreasonable to think that a tactic would or could be conceived to make it appear there is a new CEO heading the company, and to indicate this new CEO will move the company into the weed selling business? Naive investors just lose their minds when a company mentions they will be associated with marijuana in any way. And… if folks think that Mr. Steven Samblis is no longer involved, they will be more likely to take a (or another) chance by investing in the company. Larry and Mr. Steve Samblis had 59 more communications as a result of this initial contact, over the period of 7/13/2017 through 8/3/2017. We mention the vast number of communications (emails) during this period to illustrate the apparent significant desire on the part of Mr. Samblis to have his namesake domains back. It’s also noteworthy that he does have a domain in his namesake already. If he has his own site, in his own name, why work so hard to get another one ? “Provide me with the “Private Transaction” document supporting your statements that you have nothing to do with the company, and yes, you can.”. What was the end result of these discussions… No deal. Mr. Samblis stated Mr. Sirianni would not allow him to release the document. So… you be the judge. Why would Mr. Sirianni refuse to release this document? At one point Larry offered to consummate the deal if Mr. Sirianni filed the document with the SEC. The actual document was not really needed to be in-hand, simply available for the public to see. That offer was refused also. So, the reasonable question here is… WHY??? What is in that “Private Transaction” document, so important and confidential that IMTV doesn’t want the investing public to see? As a public company, doesn’t the investing public have a right to view what’s in this document? If IMTV really wanted to be up-front and transparent with important details about the company, wouldn’t they be eager to release the document? One would think that if there really was a “sale”, Mr. Sirianni would be eager to disassociate himself, and IMTV, with Mr. Samblis. Or, do they just want to put out grandiose press releases primarily designed to create irrational exuberance by naive investors? Do we believe Mr. Samblis… not for one second! And, because neither one of them would release the document, when any reasonable person could see it would be in both their best interest to do so, makes us believe ever stronger that something just doesn’t pass the smell test about the supposed “sale”. We are certainly willing to believe there was really a sale, but it will take documentation in order for us to believe it. If there is no documentation to support their claims, it’s just more fake news to us. Feel free share your thoughts with the world about this by using the “Leave a Comment” functionality at the bottom of the page. Mr. Samblis or Mr. Sirianni are free to respond also. The world would love to hear why they will not release the document! Note: We will not be publishing the verbatim email chain at this time. If Mr. Samblis or Mr. Sirianni were to dispute these conversations, then we would certainly publish them all in order to document the truth.